Source: Produced in insect cells. Human recombinant matriptase (aa 619-854) is fused to a His-tag. Produced in a baculovirus expression system. Formulation: Liquid. In 50mM TRIS containing 10% glycerol. SDS-PAGE Analysis. Lane 1: Marker, Lane 2: Matriptase His-tag recombinant protein. 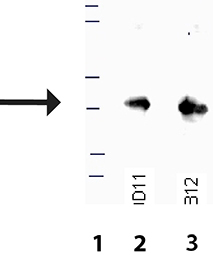 Matriptase His-tag recombinant protein was purified over a Ni-NTA bead column, washed, and then eluted into 0.5ml fractions which were then combined for the final purified product. 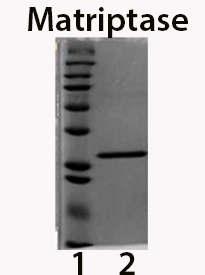 Western blot analysis of Matriptase (human), (recombinant) (His-tag) (Prod. No. ADI-908-301) probed with Matriptase, mAb (D11) (Prod. No. ADI-905-1008) (lane 2) or Matriptase, mAb (B12) (Prod. No. ADI-905-1007) (lane 3). Lane 1 includes a representative MW Marker.